Just another reason to watch TV. I had never seen a Scotch egg until I saw Ewen MacIntosh’s character, Keith, eat one on the BBC version of The Office. Then I became obsessed. Since that episode, I have been lucky enough to travel across the pond and sample Scotch eggs in my father’s own motherland. I found that nearly all I sampled were a perfect size for Keith’s gargantuan mouth, but way too big for the average piehole. I applied a little bit of bird-dog ingenuity and came up with the answer: Scottish Quail Eggs. A perfect fit for most mouths. The tarragon mustard sauce is just this American showing off. Fill a large mixing bowl two-thirds full of ice water and set aside. Carefully put the quail eggs in a medium saucepan and cover them with cold water. Add the vinegar and salt. Bring to a boil, immediately lower the heat, and simmer for 3 minutes. Drain the hot water from the eggs. Put the eggs in the ice water and let them cool completely, for 8 to 10 minutes. To peel the eggs, gently roll them on a hard surface to crack the shell all over. Beginning with the rounder end, peel off the shell. Be patient. Pat dry with a paper towel and set aside. Line a baking sheet with waxed paper and set aside. Have four bowls ready. Fill the first bowl with sausage, the second with flour, the third with beaten egg mixture, and the fourth with bread crumbs. Flatten 1 heaping tablespoon of sausage into a disk in the palm of your hand. Dredge a hard-boiled quail egg in the flour. Shake off any excess flour. Place the egg in the center of the sausage disk and mold the sausage around it, making sure the entire egg is covered. Dip it into the egg mixture, then roll it in the bread crumbs. 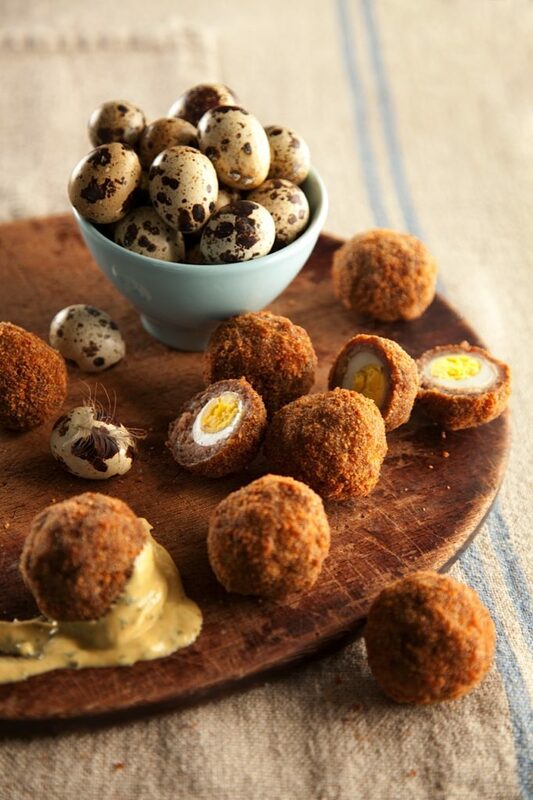 Put it on the prepared baking sheet and repeat with the remaining quail eggs. Chill the eggs for 30 minutes. Heat at least 4 inches of oil in a deep-fryer or Dutch oven to 360 ̊F. Working in batches, gently slide the chilled eggs into the hot oil and fry for 3 to 4 minutes, turning, until golden brown. Remove the eggs to the paper towel–lined baking sheet to drain. Sprinkle with salt. Serve warm with Tarragon Mustard Dipping Sauce. Combine the mustard, mayonnaise, tarragon, and vinegar in a small mixing bowl. Salt and pepper to taste.